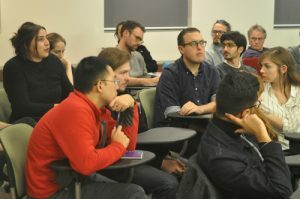 Graduate students and faculty participate in a Q&A following a departmental colloquium. The Department of Philosophy at the University of Toronto is the top-ranked philosophy program in Canada, and one of the leading philosophy departments in the world. With over 50 graduate faculty active in both teaching and research, we are able to offer supervision in all major areas of philosophy, as well as a broad range of graduate courses every year. Graduate students are a vital part of our research community, not only attending courses but also organizing reading groups and workshops, and participating in our very active calendar of lectures and conferences. In recent years, our students have published papers in journals such as The Journal of Philosophy, Philosophical Studies, Philosophical Quarterly, Analysis, British Journal for the History of Philosophy, and Philosophy of Science. 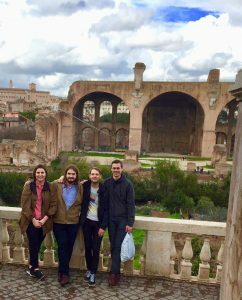 Graduate students receive special funding for travel, to present their research at conferences such as the American and Canadian Philosophical Association Meetings, the Joint Session meetings in the United Kingdom, and specialized workshops and conferences in a great variety of areas of philosophy. Located in the heart of the cosmopolitan city of Toronto, the Philosophy Department is housed in a newly renovated Art Deco Building (the Jackman Humanities Institute), with lounge and study space for students. Every graduate student we admit is guaranteed financial support for the prescribed duration of the program. This support fully covers tuition, fees and health insurance, and also includes funds for living expenses.